Sainte-Maxime ideally located in the heart of the Gulf of Saint-Tropez, is an exclusive destination on the Riviera. Sainte-Maxime is a tranquility haven where strolls by the sea invites you to live moments that you would like to be everlasting. This little piece of paradise between land and sea harbours numerous beaches where bathing, relaxing and water activities are combined with a soothing and family atmosphere. With 11 kilometers of Mediterranean shoreline, Sainte-Maxime invites to the delights of the beach. Whether you are with family, friends or as a couple, the atypical and full of charm beaches fulfil all your desires. Sainte-Maxime and its constant desire to environmental protection and reasoned development have been rewarded since 1987 with the grant of the famous European label "Blue Flag". This label recognises and guarantees bathing water quality and environmental performance. The beaches and fields of posidonia (algae-like sea plants found on Mediterranean beaches) represent a natural environment that everyone must seek to preserve. 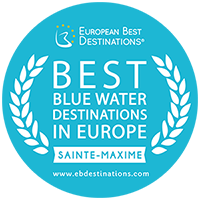 Sainte-Maxime was selected "Best Blue Water Destination" in July 2017 for the quality of its crystal clear waters! You want a change of scenery and nature? Stroll along the beaches of Sainte-Maxime. Fine sand or coves, it’s a little piece of paradise to enjoy friendly and restful moments on the shore! Picnic, tan, dive, explore! A magical place where young and old can discover plants, seaweeds, shellfish and crustaceans ... A wild and natural peninsula called "Little Corsica". A haven of peace where follow relaxation and fun, enjoy your free time to get there! Sainte-Maxime harbours many beaches where swimming, relaxation and seaside activities combine in a gentle and family atmosphere. Have fun! Jet-skiing, diving, parasailing... There’s something for everyone! Awareness raising measures, protection of marine species, human help... The Pelagos Sanctuary implements various actions in order to preserve marine mammals in the Mediterranean Sea. NEW: excursion to the discovery of cetaceans! For a reception and personalised port services, the port of Sainte-Maxime is an ideal place! Historical, it is an important symbol of the town since the 18th century.